July 4, 2013 - Oshkosh, Wisconsin, the Experimental Aircraft Association (EAA) has filed a lawsuit against the FAA with the US Court of Appeals for the Seventh Circuit in Chicago, Illinois on Wednesday. The suit filed is in response to fees assessed by the FAA for providing air traffic control services during the 2013, EAA AirVenture, commonly known as the "Oshkosh Airshow". In court filings EAA states that over the past 60 years taxes collected from aviation fuel sales at the show covered the cost of FAA air traffic control staffing needed to ensure safe arrival and departure from the airshow. However, this year the FAA requested the payment of $450,000 for providing such services. In 1953, the EAA was founded as a flying club. At the time aircraft that were modified or built from scratch were required to display an EXPERIMENTAL placard where it could be seen on the door or cockpit. So it was natural that the club would call its self the Experimental Aircraft Association. Since its inception, the club has grown into an organization of 175,000 members and nearly 1,000 chapters worldwide. EAA AirVenture Oshkosh is America's largest annual gathering of aviation enthusiasts held each summer at Wittman Regional Airport in Oshkosh, Wisconsin. The airshow is seven days long and typically begins on the last Monday in July. 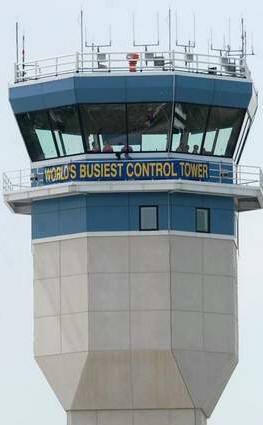 The airport's control tower is the busiest control tower in the world during the gathering. EAA challenged the fee, on May 8, 2013, the FAA issued a final order which required the organizers to sign a contract to agree to reimburse the FAA for its cost to proved ATC services during the 2013, Oshkosh Airshow. If not the FAA would not provide them the service needed for an airshow. The contract was memorialized in a Non-Federal Reimbursable Agreement between Department of Transportation Federal Aviation Administration and Experimental Aircraft Association, Inc., Oshkosh, Wisconsin. Jack J. Pelton, EAA Chairman said "While we understand the FAA's position and the temptation to augment its congressional appropriation, we naturally don't agree since we believe this approach unlawfully circumvents congressional approval and standard due process. This affects AirVenture and numerous other aviation events throughout the nation in an unauthorized and unjustified manner. That is why we are seeking review, relief, and clarification from the court." FAA air traffic controllers say working the EAA AirVenture is the “Super Bowl” of air traffic control. The work is challenging and unique. In 1961, The Rockford EAA airshow had 10,000 aircraft movements. In 1971 the EAA airshow at Oshkosh brought in 600 planes and 31,653 movements. Presently AirVenture brings in more than 10,000 airplanes of all kinds. Special air traffic procedures, not seen or used anywhere else, are used to ensure safe, coordinated operations.